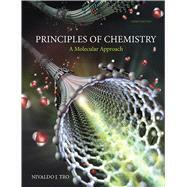 The Third Edition of Principles of Chemistry: A Molecular Approach presents core concepts without sacrificing rigor, enabling students to make connections between chemistry and their lives or intended careers. Drawing upon his classroom experience as an award-winning educator, Professor Tro extends chemistry to the student’s world by capturing student attention with examples of everyday processes and a captivating writing style. Throughout this student-friendly text, chemistry is presented visually through multi-level images that help students see the connections between the world around them (macroscopic), the atoms and molecules that compose the world (molecular), and the formulas they write down on paper (symbolic). The Third Edition improves upon the hallmark features of the text and adds new assets—Self Assessment Quizzes, Interactive Worked Examples, and Key Concept Videos—creating the best learning resource available for general chemistry students. MasteringChemistry from Pearson is the leading online homework, tutorial, and assessment system, designed to improve results by engaging students before, during, and after class with powerful content. Instructors ensure students arrive ready to learn by assigning educationally effective content before class, and encourage critical thinking and retention with in-class resources such as Learning Catalytics™. Students can further master concepts after class through traditional and adaptive homework assignments that provide hints and answer-specific feedback. The Mastering gradebook records scores for all automatically graded assignments in one place, while diagnostic tools give instructors access to rich data to assess student understanding and misconceptions. Nivaldo Tro is a Professor of Chemistry at Westmont College in Santa Barbara, California, where he has been a faculty member since 1990. He received his Ph.D. in chemistry from Stanford University for work on developing and using optical techniques to study the adsorption and desorption of molecules to and from surfaces in ultrahigh vacuum. He then went on to the University of California at Berkeley, where he did postdoctoral research on ultrafast reaction dynamics in solution. Since coming to Westmont, Professor Tro has been awarded grants from the American Chemical Society Petroleum Research Fund, from Research Corporation, and from the National Science Foundation to study the dynamics of various processes occurring in thin adlayer films adsorbed on dielectric surfaces. He has been honored as Westmont's outstanding teacher of the year three times and has also received the college's outstanding researcher of the year award. Professor Tro lives in Santa Barbara with his wife, Ann, and their four children, Michael, Ali, Kyle, and Kaden. In his leisure time, Professor Tro enjoys surfing, mountain biking, being outdoors with his family, and reading good books to his children.